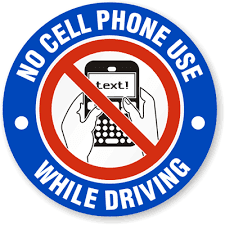 MAYBE WE ARE noticing it more, but people seem to think it's OK to text and drive, or even talk on the cell phone and drive. It's not. First of all, it's against the law. You can argue all you want about how unfair it is and how your civil liberties are being violated, blah blah blah. The fact is, people who can't take their eyes off their phones shouldn't be driving. This morning at Sixth and Jefferson, a woman heading south almost crashed into me. She had two little kids in the back. She had her head down and was laughing at her phone. She even held it up as she went through the intersection. I got there a full five seconds before her, but I saw her texting on the phone, so I waited, and sure enough, she didn't come to a complete stop and just kept going. The dogs and I weren't pleased. When I honked, she merely looked up, shrugged, then looked back down to keep texting as she headed south. Sheryl says she sees it all the time. Maybe I'm just becoming more aware of it. On Maine Street the other day a driver was wobbling all over the place as she blabbed on the phone. I just saw a guy at Fifth and Maine stop at the last second for the red light. Fortunately it didn't interrupt his conversation. What it really comes down to is this - do we need to talk to somebody or send them a text so badly that it's worth crashing into somebody else for? Can we put down the phone for a few minutes and not drive distracted? If somebody texts or calls, can we simply wait? Certainly there are exceptions, but not many. The answer for many people in our cell phone-happy world is ... no. And that makes it dangerous for all of us.